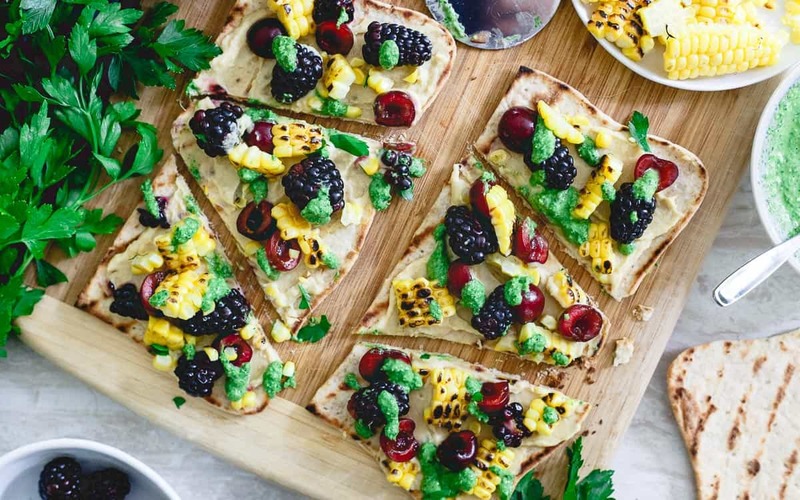 This summer inspired hummus flatbread is topped with grilled corn, berries and drizzled with a fresh roasted garlic parsley pesto. A great pre-dinner bite! Last week I shared these sweet potato crostini with you guys and talked all about our new patio getting its finishing touches so we could finally entertain, sunbathe and enjoy the new outdoor space. Yeah, well that was a slight bit premature. What I failed to realize was that just because the workers wrapped up their part of the whole patio process, those tinnnnnny little details like landscaping around the patio (have you ever tried to a dig a hole for a tree in ground that has been run over and over by heavy machinery for the past week? Not fun. ), growing the grass back, taking off the old railing of the deck leading onto the new patio, power-washing said deck, building new stairs from the deck to the patio, furnishing the patio, planting the pots….omg it’s literally a never-ending list. We spent the entire weekend (literally every daylight hour) working on it and at this rate we might have a finished product to enjoy by…August. I’m beat, I’m broke (holy hell is composite decking expensive) and the type A “WE NEED TO GET EVERYTHING DONE NOW” part of me is literally twitching with anxiety about it all. 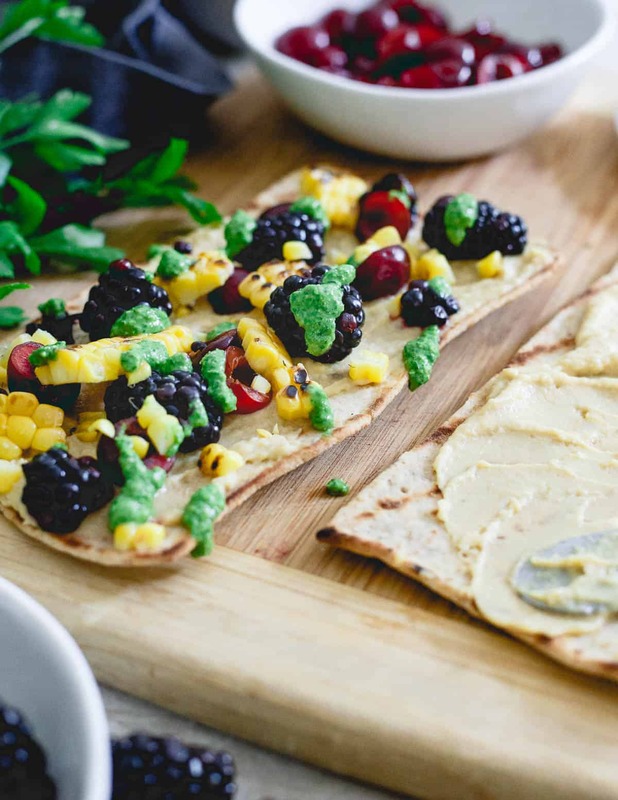 BUT…I forced myself to chill for a day (well part of a day at least), made this grilled corn and berry flatbread with hummus and simply pretended like the to-do list wasn’t hovering over my head. Reality is no one cares that the space isn’t totally done except me. 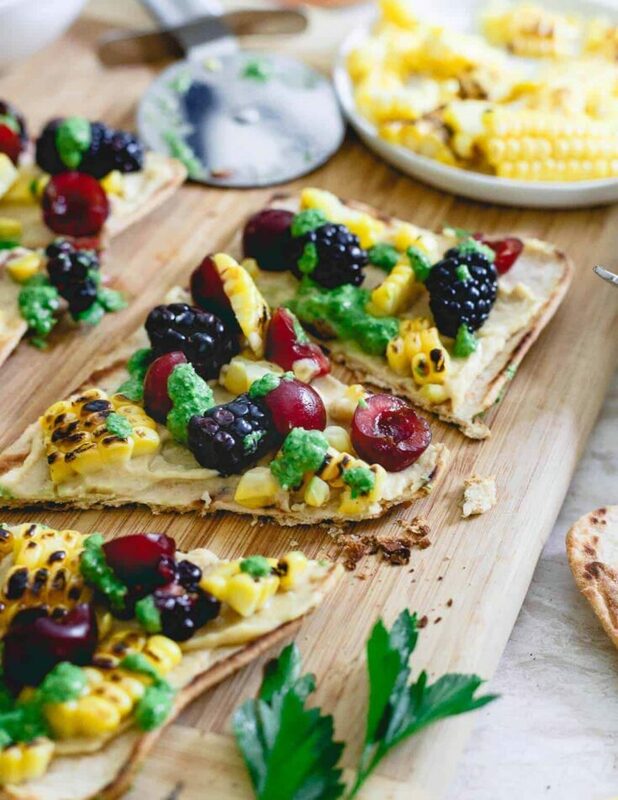 Especially when there’s delicious summer foods in front of them like this flatbread smothered in hummus and topped with charred corn and fresh summer fruit. I’m so freakin’ stoked that berries are starting to actually taste like berries lately and the corn I bought on a whim the other day was literally some of the best I can remember tasting in a long time. Both of which inspired me to put together this hummus flatbread with them. 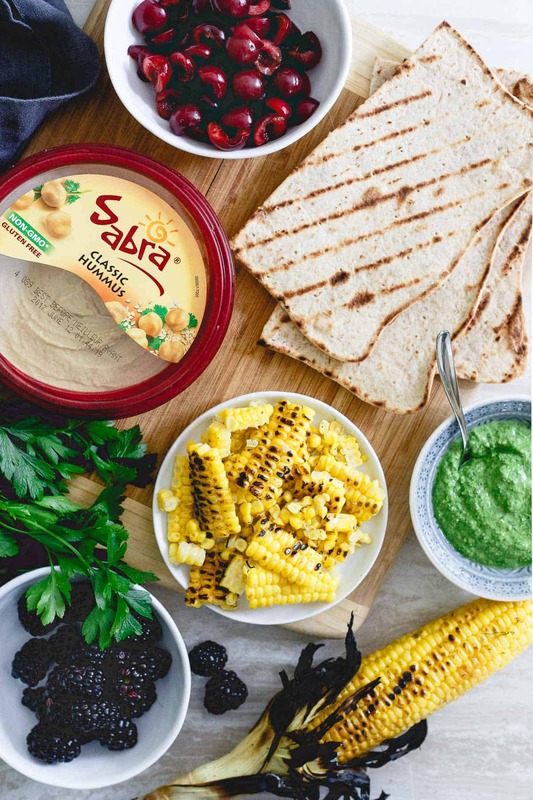 On a grilled flatbread topped with Sabra’s classic hummus is grilled corn, sweet blackberries and cherries and a drizzle of roasted garlic parsley pesto – it all just screams summer! I debated calling this a hummus flatbread pizza recipe but I think pizza might be a little misleading without any cheese. In any case, it’s reminiscent of pizza in a light, summery, fruity way. It’s the kind of recipe that’s perfect for summer snacking before dinner – The Unofficial Meal as Sabra likes to call it – but can easily be a light vegetarian lunch too, much like this hummus toast recipe too. In my case, it was the perfect bite after a long days worth of work. Hopefully next time, we can enjoy it on a finished outdoor space! Grill flatbreads until slightly charred and toasted. 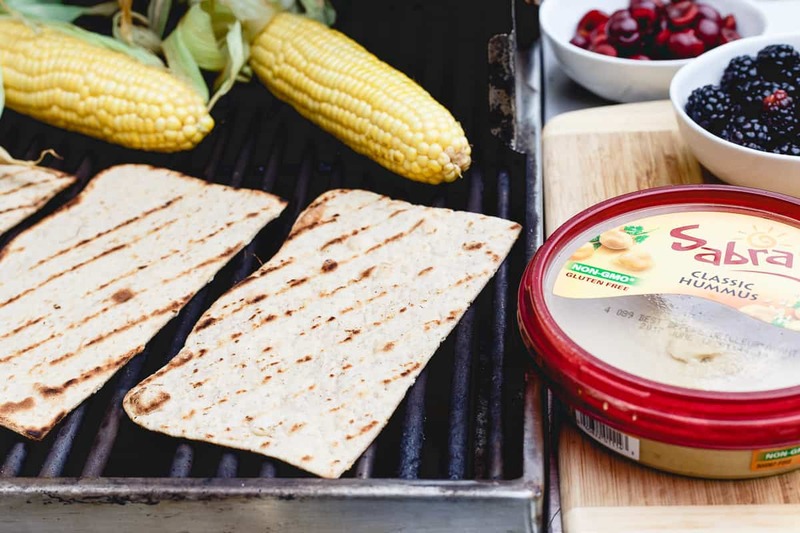 Spread hummus on each flatbread and top with blackberries, cherries and grilled corn. Drizzle with pesto, slice and serve. This is totally my kind of appetizer Gina. I ‘m always looking for new ways to enjoy hummus. Hope the outdoor space all gets done soon! I puffy heart the addition of the blackberries. These look amazing. The flavors here look fantastic. Absolutely perfect for this time of year! I love all the sweet and savory bite to this! The blackberries are such a good idea! totally going to make this and LOVE the Sabra and the fruit! best flatbread EVER! What a unique flatbread! Seriously obsessed. Love the berries on this. Berries on flatbread is the best combo if you ask me! What a great combo of flavors! !